But just because that chatter goes on in our brains, it doesn’t mean we should stay still. We know risks are good; they’re what push us to new heights. They make us learn, grow, and be better than we were the day before. Even if we fail, those experiences are rich since we have so much to learn from them. Never mind the fact that we expect our students to take risks every single day, so we should model that process, failures and all. 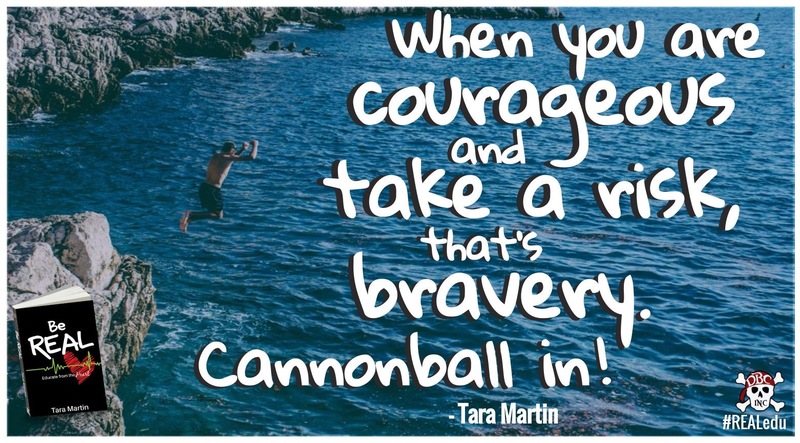 So, if we know that risk-taking is good for us, why do we still struggle to cannonball in, as Tara Martin says in her book, “Be Real“? A week and a half ago, our pool was finished being installed and we were finally able to jump in. Fortunately, the weather has been absolutely incredible and we’ve been swimming every single day since. My four boys have always loved the water and love to go swimming at every opportunity, but the progress that I’ve seen in the last 10 days have been astronomical. Although I could share many examples, I will focus on one with Brooks, one of my twins who will turn four at the end of this month. jump far and full of confidence… over and over and over again, making waves and splashing everyone around! It’s okay to watch at first and give yourself time to build the courage to take a new risk; just make sure you do take the leap. If you’re waiting for the moment where you’ll feel completely comfortable, you’ll wait forever. Take the time to check out your surroundings and see how deep the water is. Weighing out the pros and cons is a valid thought processes to go through. As educators, we should always use our professional judgment as well as our skills and knowledge to help us determine if a certain risk is worth taking. But once it’s a go, build up that courage, and jump! Baby steps are progress, you don’t need to jump in far the very first time. That very first jump that Brooks took into my arm was a risk. The next jump sliding in backwards was also a risk. Every subsequent jump was a risk. Risks get easier the more you do them. You will feel exhilarated and that feeling becomes addicting! Get jumping, even if you need someone to hold your hand at first. It will get easier! Having models and supporters around you always helps, just make sure you surround yourself with the right kind of people. I can’t help but think how this situation would’ve been drastically different had one of his brothers pushed him into the water from the sidelines when he was just getting ready to try for the first time. Or how a simple comment such as “As if you can’t jump in, you’re such a baby” could’ve squashed his confidence and made him revert back to what he knew was safe. In this day and age, you have no excuses; there are people all over the world who will encourage, support, and push you; find your tribe! Can’t touch the bottom of the pool and can’t swim yet? No problem, wear a puddle jumper! Hate the thought of going under and getting water in your eyes? There are goggles for that! You may be able to reduce your stress and anxiety about a certain risk if you think it through and brainstorm possibilities that might come your way. You can’t control everything, which I know is totally scary, but if you can control a few things, it may be just what you need to jump in the first place. So, are you ready to take the leap? Need more convincing? 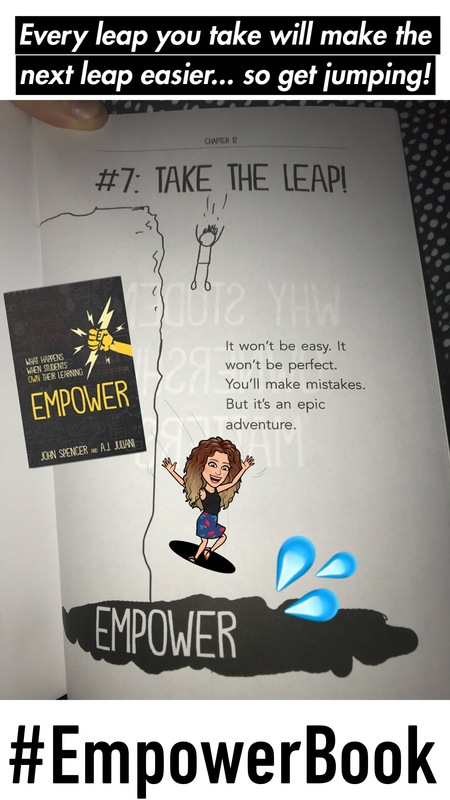 Check out John Spencer and AJ Juliani‘s book “Empower” and Tara Martin‘s book “Be Real“!